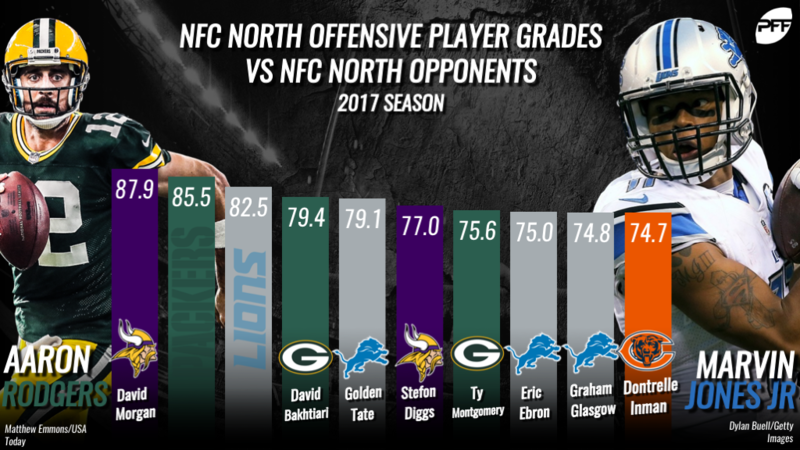 David Morgan is one of our secret superstars on offense, but he might not be too secret to the rest of the NFC North. As a second tight end, he doesn’t dominate any games, but he makes the most of his opportunities on the field. In 40 snaps in route against divisional opponents, Morgan caught five of his six targets for 61 yards, giving him a higher yards per route run average than any NFC North starter. Run blocking is his bread and butter, and he led all tight ends in the division with a 74.3 grade in the ground game. Before his injury, Aaron Rodgers took advantage of a struggling Bears team in Week 4. It’s no surprise that he led NFC North quarterbacks with a 124.6 passer rating and an 81.5 adjusted completion percentage in divisional games. He’s historically been at his best in these games, and he took care of the ball this year with no interceptions and no turnover-worthy throws to go with four touchdowns and two big-time throws. The most dominant receiver in NFC North games last season was Marvin Jones Jr. He averaged nearly 20 yards per reception, putting up 509 yards and six touchdowns in his six games. Out of his 26 catches, 22 went for first downs, and 14 were explosive plays (plays of 15-plus yards). He did a lot of his damage against the Packers in Weeks 7 and 17, but all three divisional opponents struggled to keep him under wraps. In an injury-shortened season, David Bakhtiari earned the highest grade of his career, and he kept the blindside locked down against divisional foes. He allowed one pressure in one game against the Bears and two pressures in two games against the Lions. He was spotless in pass protection in Week 6 against the Vikings, with his only struggles coming in Week 17 against Minnesota’s vaunted edge rushers. Still, he only allowed two hits and five hurries on 171 pass blocking snaps, providing valuable protection for Aaron Rodgers and Brett Hundley. Golden Tate might have been overshadowed by his teammate, but NFC North opponents had trouble bringing him down too. He did most of his damage against the Packers with 14 catches for 217 yards in two games, but he led all receivers with six avoided tackles and 215 yards after the catch in the six divisional games. Tate also carried the ball three times for 15 yards against the Vikings. Adam Thielen had more catches and yards in divisional games, but Stefon Diggs had more explosive plays (8) and was more efficient on a per catch and per snap basis. Ty Montgomery led all NFC North running backs with 5.5 yards per carry in divisional games last year. No tight end had more catches or more first downs than Eric Ebron in the division last year, but he joined the Colts this offseason after the Lions released him. Graham Glasgow allowed only six pressures in six divisional games last year. Despite recording eight explosive plays and 12 first downs on 15 catches in the NFC North last year, Dontrelle Inman has been out of the league all offseason. The highest-graded safety in the NFL last season was also the highest-graded player in the NFC North. Harrison Smith had the highest coverage grade (91.9), the second-highest run defense grade (86.5) and second-highest pass rushing grade (83.6) of any defensive back in the division. Four of his five total interceptions last season came in these games, and he allowed just a 12.9 passer rating when targeted, the best of any defender in coverage. Smith is the best of the best, and he’s at his best against the Bears, Packers, and Lions. 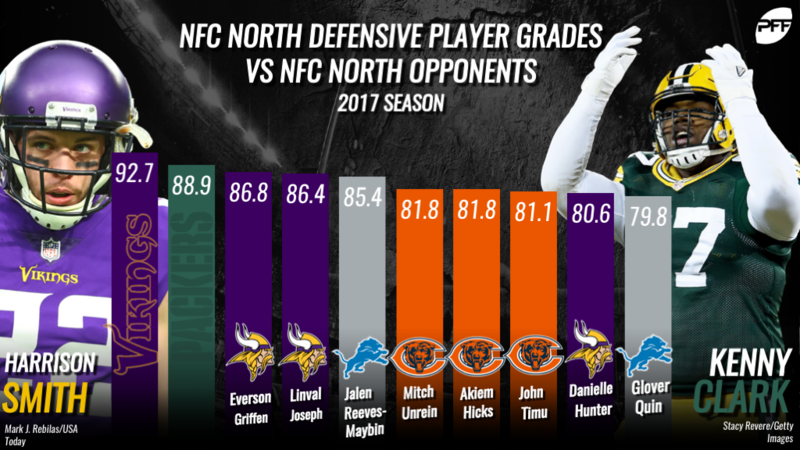 All three divisional opponents had trouble blocking Kenny Clark in the running game. His 11 run stops were the second-most among interior defensive linemen, and he missed only one tackle on 126 run defense snaps. As a pass rusher, he notched two sacks, two hits and 11 hurries on 132 opportunities, giving him a pressure percentage of 11.4 percent that ranked second only to teammate Mike Daniels at his position. Clark was also the only interior lineman to force a fumble in a divisional game. Everson Griffen led the division’s edge rushers with an 87.8 grade and five sacks. Danielle Hunter actually had more total pressures, but Griffen had more total rushes beating the blocker, and his rushes were quicker and more effective at disrupting the quarterback. He also added six stops in run defense and a batted pass, and he dropped back into coverage three times. The quintessential nose tackle, Linval Joseph is one of the NFL’s most consistent run defenders. He led NFC North interior defensive linemen with 19 tackles in run defense, 11 of which were stops. He also had the most run defense snaps (109) without a missed tackle. Joseph quietly won 12.1 percent of his pass rushes too, the third most at his position in the division. He recorded one sack, four hits and five hurries against the rivals. Jalen Reeves-Maybin didn’t start any games this season, but he played just enough snaps in five divisional games to qualify. He had the highest coverage grade of any NFC North linebacker, but his limited sample size kept him from accumulating many volume stats. He was targeted nine times on 43 coverage snaps, allowing six catches for only 26 yards. Reeves-Maybin’s 70.1 passer rating when targeted was best at his position. All 10 of his tackles in run defense against divisional opponents were stops. Akiem Hicks’ 15 total pressures and 15 run stops were the most at his position in the NFC North. Another small sample size, John Timu had two run stops and allowed three catches for 12 yards while in coverage. Danielle Hunter led the division’s edge rushers with 26 hurries and 30 total pressures. Glover Quin was targeted only six times on a division-leading 222 snaps in coverage.